Iron Man’s original artist gets his due! Remember a few years ago, when we announced we were publishing a book on Vince Colletta, the controversial inker who was so prolific in the Silver and Bronze Ages? A lot of people initially scoffed at the idea of giving Colletta his own book, due largely to his reputation within fandom of… shall we say, not being a fan-favorite? Then, when The Thin Black Line: Vince Colletta was released, it garnered rave reviews for finally documenting the compelling life and career of a pivotal comics artist, about whom little was known publicly. 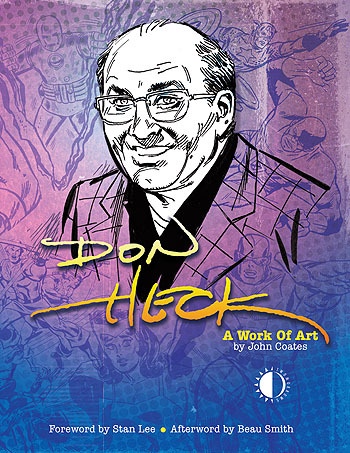 Well, we’re at it again with our new book Don Heck: A Work of Art, which is officially shipping this week from TwoMorrows (and should be in stores next week). In it, the original artist of Iron Man, Black Widow, Hawkeye, and key Avengers issues finally gets his due, thanks to author John Coates, who tirelessly researched Heck’s background and career. The crux of the book is two lengthy interviews with Heck (a rarely-seen published one by Richard Howell, and an unpublished one by Will Murray), which have been melded together to make, what we think you’ll find, to be a pretty seamless conversaton with Don, about all aspects of his career dating back to his horror work in the 1940s and ’50s. There’s a wealth of examples of his work (all in full-color), and even a special chapter where we debunk the myth that putting Don as artist on a comic meant the sales would drop (wait’ll you see what the actual sales figures tell us). 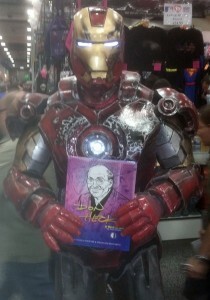 And Stan Lee even provides the intro. This full-color hardcover is 192 pages long, for $39.95. Give it a shot; you won’t be sorry. And check out our free preview and order HERE.